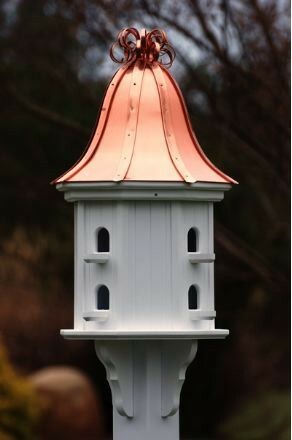 This work of art birdhouse features 8 compartments with 8 perches and a unique curly copper roof. Roof lifts off for easy cleaning. Will not rot crack split or fade and is guaranteed by the manufacturer.! 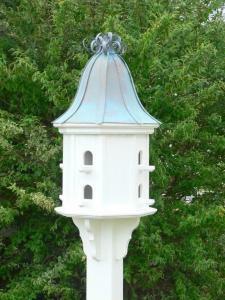 This beautiful copper and vinyl white birdhouse will be the focal point of your yard guaranteed! Complete with Vinyl collar and attached decorative brackets - fits on YOUR 4 x 4 post. Post available at most home improvement stores. NOTE:AVAILABLE ALSO IN SHINY BRIGHT COPPER ROOF AS WELL. PLEASE SPECIFY ON CHECKOUT.